Banana blossom salad (sometimes also called banana flower salad, yam hua plee or ยำหัวปลี) is a dish that isn’t commonly found in Thailand, but it’s superdelicious and at the same time refreshing – just the right kind of lunch food on a hot, sunny day in tropical Thailand. You’ll see plenty of them when you travel to Thailand. 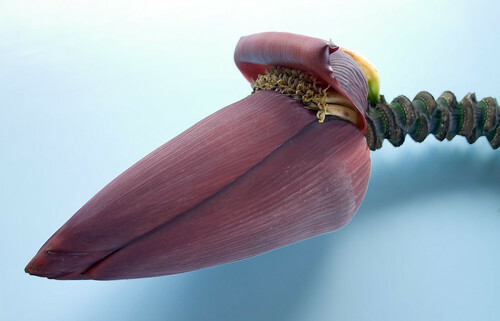 If you give a banana flower like this a couple of months, you’ll get bananas. But if you cut it at this stage, there are several things that you can do with it – one being a delicious salad. (Also, if you eat Pad Thai, a chopped slice of banana flower is often served as a condiment). If you want to know what it tastes like, the best comparison I could give you (apart from having you try it yourself) is a sweet, tender artichoke. In Thailand it is believed that cooking a soup from banana flowers is particularly beneficial for women after they have given birth. And if you’ve ever tried a banana blossom and it didn’t had this subtly sweet, tender flavor to it, then you probably tried it outside of Thailand. Because for some reason the banana blossoms outside of Southeast Asia don’t seem to be the same, and tend to be more bitter. Thai banana blossom salad has a nice mix of textures – with crunchy and soft elements in it, and a combination of sour, salty, sweet and spicy flavors. The banana blossom somehow manages to create a harmonious cooperation of all these flavors. There are many different ways to prepare it, but if you ever spot it on a menu during your Thailand trip or find a shop that sells it you should definitely give it a try.